Royal Green Maca gives you positive energy and provides powerful support for change of life symptoms. Increases vitality and promotes inner balance. 100% pure and highly concentrated (6:1). Royal Green gives you the following guarantees: 100% certified organic Maca. 100% raw. Highly concentrated (6:1). 80% black, 15% purple & 5% yellow Maca. 100% free of fillers. 100% vegetarian & vegan. Naturally gluten free. Maca (Lepidium Meyenii Walp) is a small root that grows in the Andes of Peru at 4300 meter altitude where no other plants can grow due to the difficult climate! After allowing our Maca to grow for 8 months, the Royal Green Maca is harvested. After the harvest the Royal Green certified organic Maca is dried and hand selected on size and colour (black, purple & yellow). The full process is done under monitored organic criteria and that is why Royal Green Maca is certified organic. Maca (Lepidium meyenii Walp. ), vegetable cellulose (vegicap). 1-3 vegicap per day, preferably with a meal. As with every dietary supplement, consult an expert before use in case of pregnancy, lactation, illness or medicinal use. 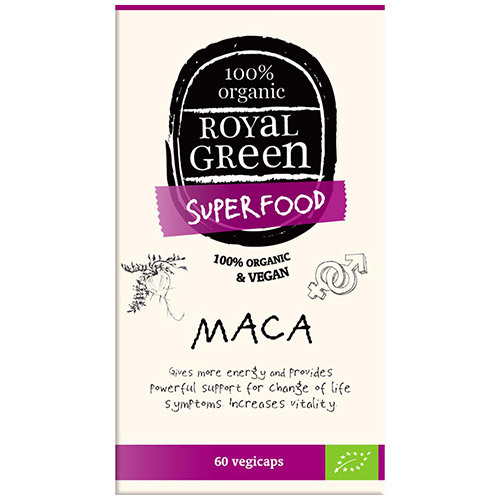 Below are reviews of Royal Green Superfood Maca - 500mg x 60 Vegicaps - Best before date is 30th June 2019 by bodykind customers. If you have tried this product we'd love to hear what you think so please leave a review. This supplement certainly gives me more energy and vitality. I take this along with daily vitamins.